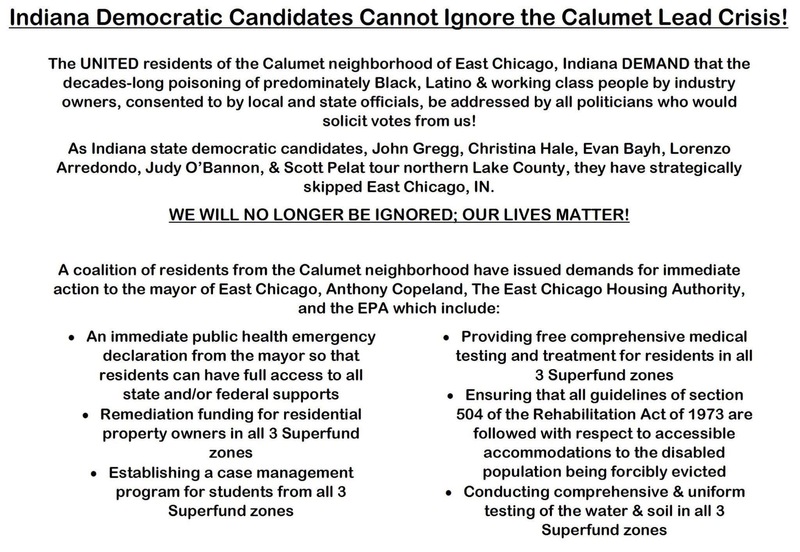 Calumet residents want a formal role in determining remediation processes in their community. And they want the EPA and all responsible parties held accountable for any and all promises made. Attorneys from the Northwestern Environmental Law Clinic, Goldberg Kohn, and the University of Chicago Law School’s Abrams Environmental Law Clinic – all representing the Calumet community pro bono – filed a motion before the Department of Justice and the Indiana attorney general’s office. East Chicago Undivided will meet this Thursday at Community Fellowship Outreach Ministries, 801 East Chicago Avenue, 5:30-7:30pm. A cavalcade of Democratic candidates for state and local office paraded through Northwest Indiana yesterday, but they did stop in East Chicago. Members of Black Lives Matter NWI/Gary and National Nurses United attended a rally at Wolf Lake in Hammond to remind the candidates of the situation in Calumet. An Associated Press report on the West Calumet Complex/HUD settlement is making the rounds today. Lauren Cross of the NWI Times took to Twitter last night to break down the deal reached between the US Department of Housing and Urban Development and the East Chicago Housing Authority and the Shriver Center of Poverty Law, representing past and present residents of the West Calumet Complex. The Post Tribune also reported on this “big relief” for residents. The Shriver Center released this press statement. A major agreement between the federal government and the Shriver Center on Poverty Law has extended the deadline for West Calumet Complex residents. Residents will now have up until the end of March 2017 to find new housing, with emergency proceedures in place for anyone having difficulties. The East Chicago Housing Authority also agreed to waive any rent owed between 22 July 2016 and 31 March 2017. Evictions, threats of evictions, and late fees are also prohibited. This is a significant victory for residents and organizers, who as of just yesterday were voicing concerns that federal aid money was favoring demolitions and not families in need.